"So this Kṛṣṇa consciousness movement is very easy. If it cannot be introduced, I mean to say, in large scale, collectively, individually anyone can learn and take the Vedic wisdom. Anyone, even a child. Man-manā bhava mad-bhakta. And what is the result? The result is mām evaiṣyasi asaṁśayaḥ (BG 18.68). Anyone who is doing this, asaṁśaya, 'Without any doubt, you are coming to Me.' That is the aim of life, how to go back to home, back to Godhead. Not to join here in the dog's race. That is not aim of life. It will not make me happy, anyone happy. The nature's law is working very stringently. You cannot avoid it. So these things are there. I can quote many verses like that. But Kṛṣṇa consciousness is very easy, and everyone should become Kṛṣṇa conscious. That is the aim of life. 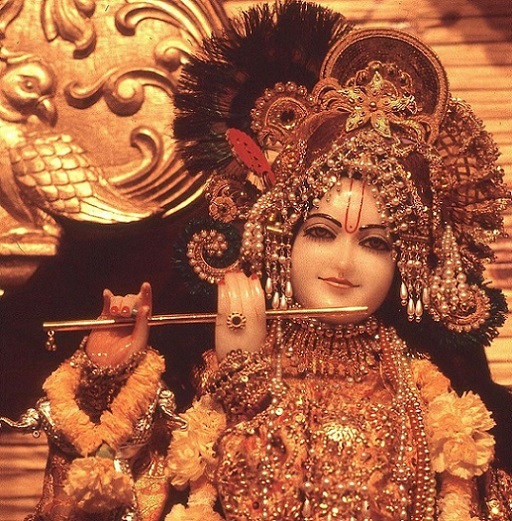 Na te viduḥ svārtha-gatiṁ hi viṣṇuṁ durāśayā ye bahir-artha-māninaḥ (SB 7.5.31). We are trying to adjust things externally, but that will never be fulfilled. Durāśayā. This is hope against hope. You cannot do anything independently because you are fully under the clutches of māyā. Bhrāmayan sarva-bhūtāni yantrārūḍhāni māyayā (BG 18.61). Īśvaraḥ sarva-bhūtānāṁ hṛd-deśe arjuna tiṣṭhati. Kṛṣṇa says, 'My dear Arjuna, Īśvara, the Supreme Lord, is situated in the core of everyone's heart.' He is not far away. And He is observing. In the Upaniṣads it is said that there are two birds on one tree. One is eating the fruit, and the other is witnessing. The witnessing bird is Kṛṣṇa, and the eating bird is the jīvātmā. So Kṛṣṇa is so friendly that He always lives with us just to turn our face towards Kṛṣṇa. Īśvaraḥ sarva-bhūtānāṁ hṛd-deśe arjuna tiṣṭhati (BG 18.61). What is His business? He is simply waiting for the time when we shall turn our face to Kṛṣṇa. That is His business. But unfortunately, we do not want Kṛṣṇa. We want something which is not Kṛṣṇa. That is our disease. Still, Kṛṣṇa is giving us facility. Bhrāmayan sarva-bhūtāni yantrārūḍhāni māyayā (BG 18.61). Kṛṣṇa gives intelligence, mattaḥ smṛtir jñānam apohanaṁ ca (BG 15.15), that 'You are My part and parcel. Why you are struggling so hard in this material world? Come to Me. I will give you all protection.' Ahaṁ tvāṁ sarva-pāpebhyo mokṣayiṣyāmi (BG 18.66). He is ready. But I'll not do. That's my obstinacy. At that time what Kṛṣṇa will do? He is affectionate father. 'All right, what do you want to do?' 'I want to do like this.' 'All right.' Bhrāmayan sarva-bhūtāni yantrārūḍhāni māyayā (BG 18.61). He immediately orders prakṛti—mayādhyakṣena prakṛteḥ sūyate sa-carācaram (BG 9.10)—'This living entity wants a body like this. So give him a body like that.' Yantra. That is called yantra. It is a machine. This body is the machine. And therefore we are changing, one body to another, yantrārūḍhāni māyayā. This is our business. So if I am now in a yantra, Mercedes car, and suppose next life I ride on another yantra which is four-legged dog, then what is the benefit of this kind of struggle for existence? But that is going on. Therefore Kṛṣṇa warns, aśraddhadhānāḥ puruṣā dharmasyasya parantapa mām aprāpya. 'The aim of life was to achieve Me,' Kṛṣṇa says, 'but the result is, because he does not hear what I say,' mām aprāpya nivartante, 'again goes back,' mṛtyu-saṁsāra-vartmani. This material world means to take birth and die. That is called mṛtyu-saṁsāra-vartmani. Now I am born as Indian or as brāhmaṇa or something like that. The next life, there is no guarantee. Kṛṣṇa does not say that there is guarantee. Kṛṣṇa says tathā dehāntara-prāptiḥ: you have to change your body. Tathā dehāntara-prāptiḥ dhīras tatra na muhyati (BG 2.13).